Tested Class 1 Bluetooth Adapterwork on a server, it allows for the broadest device support and better battery life. adapters to find the best performing and simplest to set up. This testing led to the discovery of this Class 1 RS232 Bluetooth Adapter that demonstrated the fastest connect time, and greatest throughput at 115200 baud of any device tested. However even with the device selected, configuration of most of them can get confusing as well. You must be sure to set the proper baud rate, set echo off, proper RX and TX polarity, HW flow control off, etc. So we offer these pre-configured for your MS1, MS2 or MS3 to help make it as straight forward as possible to get your Android up an going. ShadowTuner.com is a new EFI Analytics site to simplify your log file management, with much more to come. Soon ShadowTuner.com will allow you to share log files with friends giving you one place to share log files. For those of you waiting for Full tuning and the cool dashboards, no fear, they are coming. I first want to be sure we have stability and reliability for the majority of current devices. To download Shadow Logger MS, go to the downloads page. 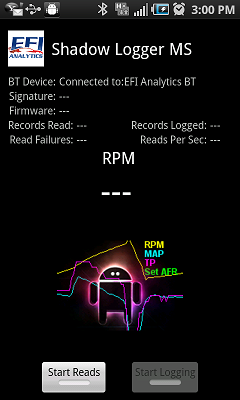 Shadow Logger MS is completely free, but not in the Android Play store. You will need to download it here and install it locally. Once the beta period expires there will likely still be a free version and a full features pay version.